EBITEBIT GuideEBIT stands for Earnings Before Interest and Taxes and is one of the last subtotals in the income statement before net income. EBIT is also sometimes referred to as operating income and is called this because it's found by deducting all operating expenses (production and non-production costs) from sales revenue. stands for earnings before interest and taxes. Fixed charges are regular, business expenses that are paid regardless of business activity. Examples of fixed charges include debt installment payments, business equipment lease payments, and insurance premiums. An FCCR equal to 2 (=2) means that the company can pay for its fixed charges two times over. An FCCR equal to 1 (=1) means that the company is just able to pay for its annual fixed charges. An FCCR less than 1 (<1) means that the company lacks enough money to cover its fixed charges. Therefore, generally speaking, the higher the fixed-charge coverage ratio value, the better, as this indicates a company operating on solid financial ground, with adequate revenues and cash flows to meet its regular payment obligations. The FCCR is often used by lenders or market analysts to assess the sufficiency of a company’s cash flows to handle the company’s recurring debt obligations and regular operating expenses. 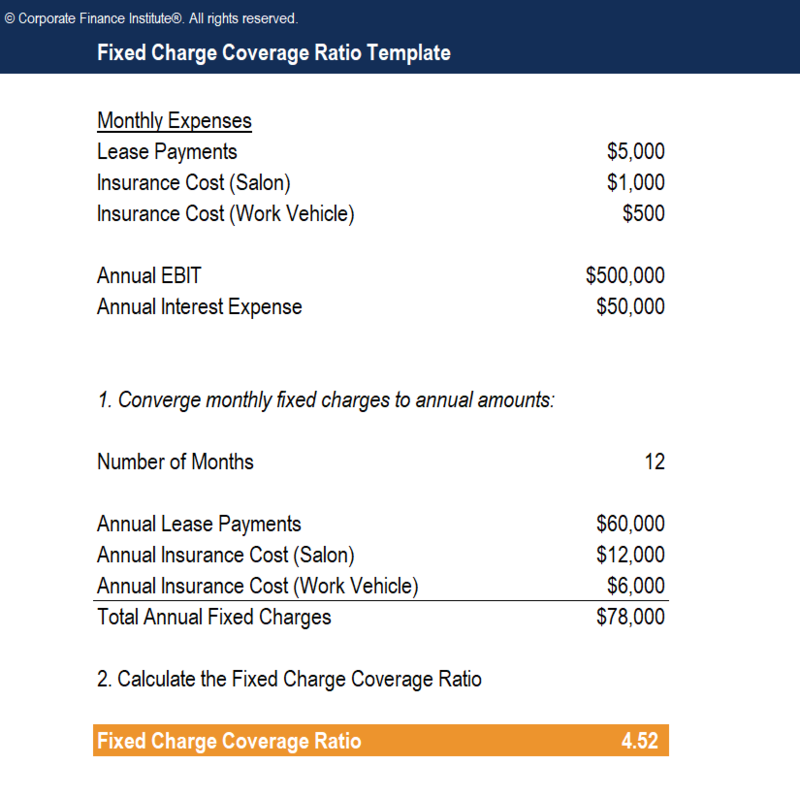 The fixed-charge coverage ratio is similar to the more basic “times interest earned ratio”, another debt or financial solvency ratio that uses earnings before interest and taxes (EBIT) to determine a company’s ability to successfully handle its debt obligations. Compare the times interest earnedInterest Coverage RatioInterest Coverage Ratio (ICR) is a financial ratio that is used to determine the ability of a company to pay the interest on its outstanding debt. The ICR is commonly used by lenders, creditors, and investors to determine the riskiness of lending capital to a company. The interest coverage ratio is also called “times ratio formula shown below with the formula for the fixed-charge coverage ratio as shown above. You may want to view the FCCR as a more conservative assessment of a company’s financial health because it takes into consideration additional fixed charges besides just interest payments, such as leases and insurance.